We took the dog in for his annual checkup today and while we were waiting decided to have lunch at a nearby restaurant (Wild Fusion). As we were leaving I noticed an aquarium right by the exit, and inside, along with the usual brightly colored fish, was this spectacular creature. I’d never seen anything like it before. The white bands had what must be scales, but looked almost like fur. At first it appeared to be suspicious of the camera and retreated backwards. Curiosity seemed to take over and it quickly started to move towards the camera – no doubt checking out what it was. The zebra moray eel is a mid-sized species of moray eel that has become known for its black and white striped appearance. The striped eel commonly has a length of up to 4.9 feet (1.5 meters), but many specimens found are much smaller. They are found in their habitat primarily in the reefs of the Indo-Pacific region and the eastern Pacific region; including California (United States), Mexico, Columbia, the Galapagos Islands, and of course the make a handsome appearance in people’s aquariums worldwide. 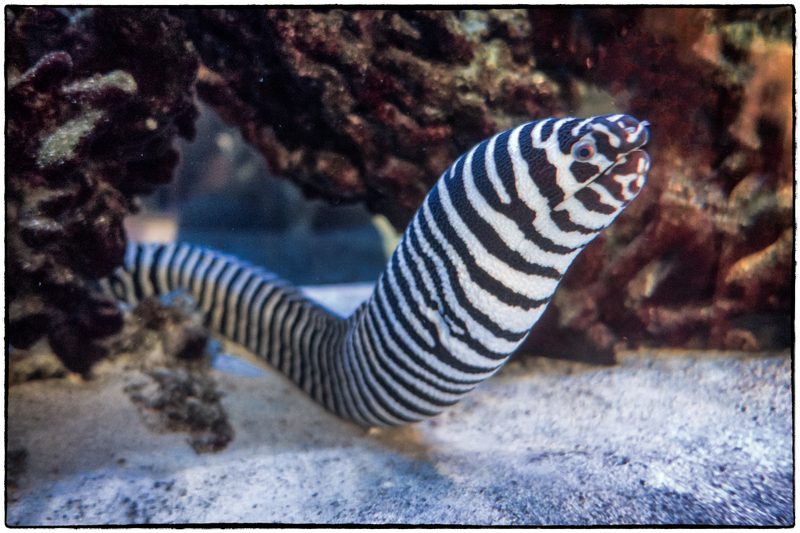 The zebra moray eel has become known as a danger to humans. The truth though is, that the eels only attack in self defense, and most bites on humans are the result of mistaken identity or attempts by humans to hand feed them – don’t try it! Like all morays, its bite has a weak release mechanism and therefore its jaw must be pried off (even in death during cases of human bites). Contrary to popular belief, their bite is not poisonous naturally, but may cause infections because of the toxic bacteria-laden algae that they eat. The zebra morays have also become known for their practice of hunting in cooperation with groupers; the only cooperative hunting that has ever been observed to go on among fish. Morays are recruited by groupers in order to use their ability to enter small crevices to flush out prey such as crustaceans, sea urchins, and mollusks; which are pretty much the only prey that zebra morays feed on. The “bounty” from these hunts is then shared between species. As we stated before, morays have primitive biting system, but that’s based sheerly on their first set of jaws, but they also have second set, known as pharyngeal jaws, that rest deeper in their bodies and are shot out into their main jaws when trapping prey. It’s not much of a picture, but after all it was dark and I was shooting through glass and water so I’m pretty much satisfied that I was at least able to capture this remarkable creature.